The input results, translation results, and reverse translation results (meaning of translation results) are displayed, in that order. To edit the input text, tap . Tap to listen to the speech output again. To expand the result display area, swipe right/left in each field. 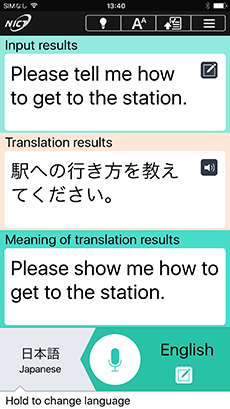 The translation results are translated back into your own language and shown in the reverse translation display area (Meaning of translation results). If the text shown here has the same meaning as your original input, the translation results are considered accurate. The text displayed in the 'Translation results' can be copied by double-tapping or holding down the text field. To display the settings menu, tap at the top right corner of the screen. Select the languages to translate between. 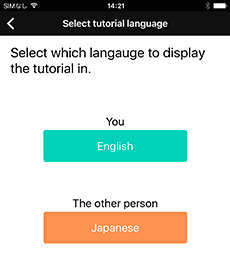 On the main screen, tap on the bottom left or hold down the target language tab to display the language selection screen. You may also go to → → "Language Settings" to display this screen. The selected language should be marked with a ‘check’. 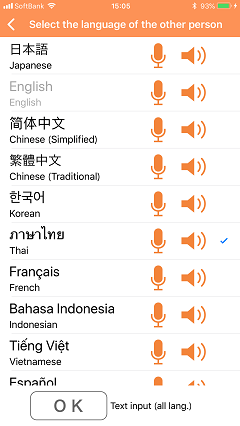 The screen components are indicated in [green] when selecting the input language (your language) and [orange] when selecting the target language (the language you wish to translate to). There are multiple ways to change languages. Tap the globe button on the bottom left to display the language selection screen. Tap the language you wish to select, make sure that a checkmark is placed next to it, and then tap the OK button. 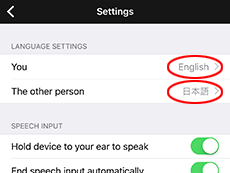 To display the "Language settings" screen, hold down the target language tab. To open "Other settings", tap at the right end of the operation menu. Select the languages to translate between under "Language settings". The "Language settings" screen should be displayed. Select the language(s) and tap OK.
2. How to change the direction of translation and display the translation results to show the other person. 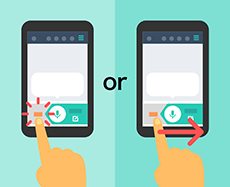 Tap or swipe the target language in order to change the input language. Only the translation results will be displayed once the input language has been changed. 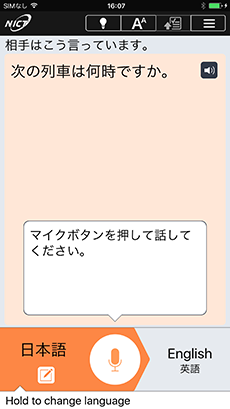 Show this screen to the other person and swipe the target language to take turns. Tap the microphone button and speak while holding the device close to your mouth. Keep your message brief and concise. VoiceTra cannot translate complicated expressions. 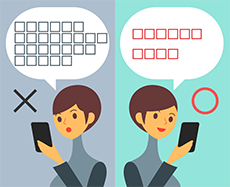 To enable text input, tap your language preference. 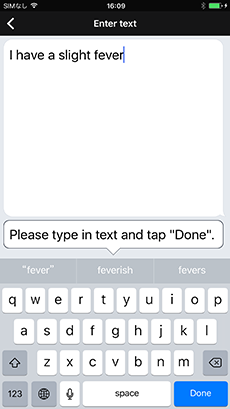 Enter text via the keyboard, and tap "Done". Display and use the Tips screen to explain how to use the app to the other person. Refer to "Tutorial" when giving further explanations. Tap in the operation menu at the top of the screen. Select a topic from the tutorial list to show the other person. The tutorials are given with illustrations and text. Tips for some of the languages will be displayed in English. Three font sizes are available. The "Report error" function can be used to report errors which may be found in the results. The "Report error" screen will be displayed. Please indicate where the error(s) is contained and submit. See "Report Errors" procedure for further details. To display setting menus, tap in the upper right of the screen. The other menu items are displayed. 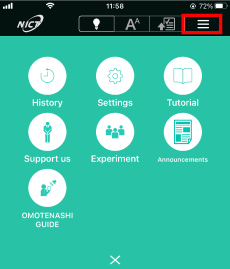 The “OMOTENASHI GUIDE” app can be launched by tapping the “OMOTENASHI GUIDE” icon in the menu. If the app is not installed, this will take you to the download page. Tap "Settings" from the menu items in order to configure the settings. The following can be configured from the settings screen. The character encoding can be specified for Myanmar. *Available for Android only. "Hold device to your ear to speak" ... Activates the proximity sensor and speech input can be triggered by holding the device to your ear as you would to speak on the phone. "End speech input automatically"... 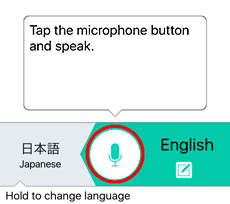 Automatically detects the end of speech and starts translation without tapping the microphone button. 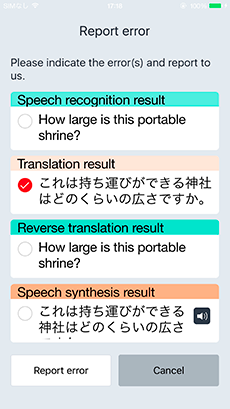 You can select when to play the speech output (synthesized speech of the translation results) from the following options. "Auto-play speech output when translated"... Plays speech immediately after the source language is input and the translation is completed. "Play speech output when switching languages"... 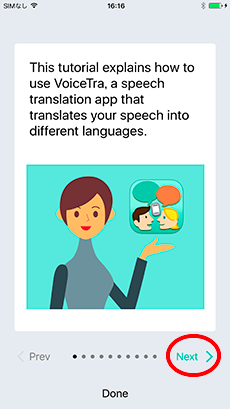 Plays speech when the input language is switched to the target language. You can select male/female voice for speech output. 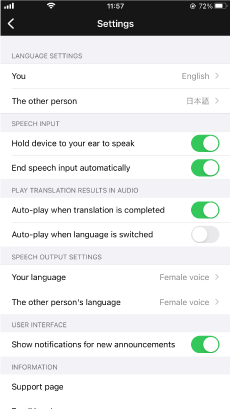 You can select male/female voice for "Your language" and "The other person's language". They are both set to "Female" by default. 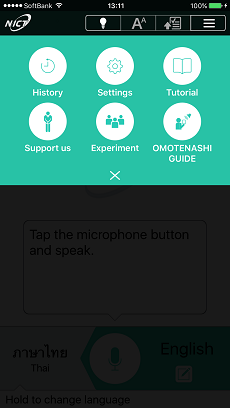 Tap the language you wish to configure and select female/male voice from the pop-up menu which will be displayed. Please note that the setting will not be applied for languages that only support either one of the voices. Changes will be applied from the next translation request. A unique number assigned to your particular copy of the app when it is installed. You may be asked for this number when making inquiries about certain issues you may have. Tap "History" from the menu to view your past inputs of the selected language. You can select a sentence from the "History" list to display it on the translation screen again. 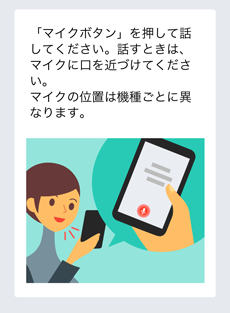 You can take advantage of this feature by translating frequently-used sentences in advance and calling them back as necessary. The "History" list can store up to 1,000 sentences. When the number of sentences exceeds the limit, the new ones will replace the oldest ones. Select a sentence from "History". The selected item from the "History" list will be displayed in the "Input results" on the translation screen. The "Translation results" will be displayed in the designated language. Tap "Tutorial" from the menu to display further details about how to use the app in both source/target languages. Select which language to display the tutorial in. The tutorial is given with illustrations and text. Tap 'Next >' to read further. An "Experiment ID" is provided by the organizer for those who are taking part in experiments. *This setting is only for users with Experiment IDs. This feature is used for experiments to collect dialogs at certain events and locations. Tap the "Experiment" from the menu. An authorization screen will be displayed. 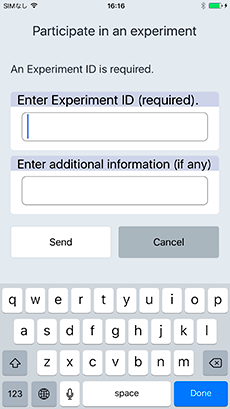 Enter your Experiment ID and tap "Send" to join an experiment. Non-OS-standard fonts for foreign languages will not be displayed properly. Please install the fonts at your own risk. You can switch between "Zawgyi-One font" and "Unicode-supported font" for Myanmar. OS-standard keyboards are not available for Myanmar, Lao, and Khmer. Please purchase the keyboards from the App Store as necessary. For Myanmar, please use a Myanmar3-supported keyboard. NICT will not be held responsible for any trouble caused by installing the keyboards. Please use them at your own risk. Please install non-OS-standard keyboards at your own risk.